Canvas roadshows proved very popular. 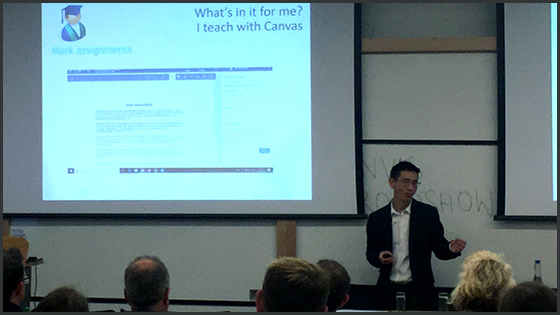 Nearly 200 students, academics and administrators, from divisions and departments as well as colleges, found out how Canvas will support teaching and learning at Oxford. 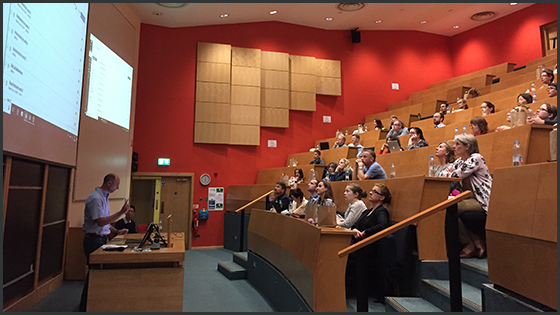 The Canvas @ Oxford project team, responsible for delivering the new Canvas virtual learning environment (VLE) that will replace WebLearn, held a number of roadshows (17, 23 and 30 May 2018) across the University during Trinity term to showcase Canvas and gather feedback to help to improve the VLE for Oxford's unique purposes. The events proved very popular and were attended by nearly 200 people in total, with representation from students, academics and administrators, from divisions and departments as well as colleges. The roadshows opened with a short project overview during which the Canvas vision was outlined, our journey to date shared and a call to action made to attendees for their continued involvement. Professor Eric Meyer, our project sponsor, spoke at the first event, with Kate Lindsay, Head of Technology Enhanced Learning, delivering the opening presentation at the following events. Dr Xavier Laurent and Fawei Geng, learning technologists in Academic IT, gave attendees an early insight into the capabilities of Canvas from the perspective of an academic, a student and an administrator. The opportunity to see Canvas demonstrated generated many questions and comments from attendees around areas such as features and functionality, how Canvas would add value to teaching and learning, as well as how it would change or improve ways of working. Thank you for this very interesting and informative event. I am looking forward to seeing how Canvas can make a difference and add value to teaching and learning at Oxford. It should be an interesting journey! Our Business Change Manager, Andy Menmuir, described the important role of the early adopters in the project and the timelines involved. Damion Young, senior learning technologist in the Medical Sciences Division, joined the presenter team at the Osler House event to discuss his own role in supporting early adopters. The sessions concluded with a panel discussion with Q&A which also included an excellent outline of the student perspective from Marianne Melsen, Vice-President of Graduates at Oxford Student Union and a member of the Canvas @ Oxford project board. We were also privileged to be joined at the final roadshow by Dr Ariell Ahearn, one of our early adopters from the School of Geography and the Environment, who described her passion at the possibilities Canvas could open up for teaching and learning. After each roadshow attendees were surveyed to get their feedback on the events as well as gather comments and ideas for the team to follow up. We have also updated the FAQs on the Canvas @ Oxford home page in response to some of the questions raised at the roadshows and will continue to add to these on a regular basis.